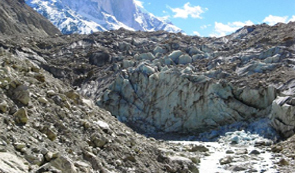 Excellent beauty of Gangotri will be anticipated in the best way, when you go for Kedar Tal trek. The route is not for the novice, especially, if you go there in the winters. 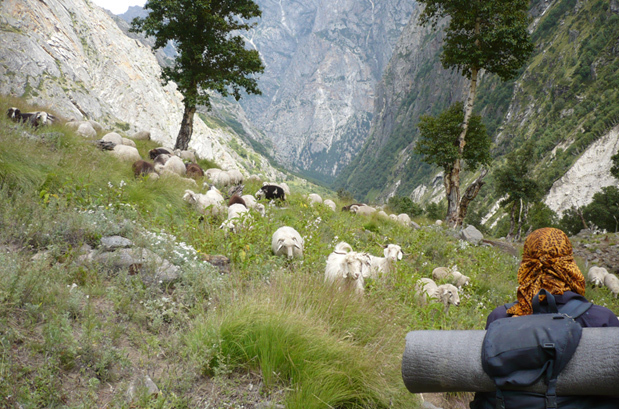 However, the summer trek is good one, with ample floral beauty on both side of the trek route. Aspiring meadows on both the side of the route is having excellent art and craft, naturally maintained by nature, is going to greet you in all of your turns. So, you will never feel tired, although the route is tough and steep. Kedartal, the extension of the Kedar Ganga has enough mythological merits, although that is covered well with utmost care from nature god alone. She is protecting the precious myths in her air, flora and the peeping snow covered hill tops. In fact, the snow covered peaks on all sides will seem to be protecting the Bhagirath Shila from all sides. The trek starts from Uttarkashi. 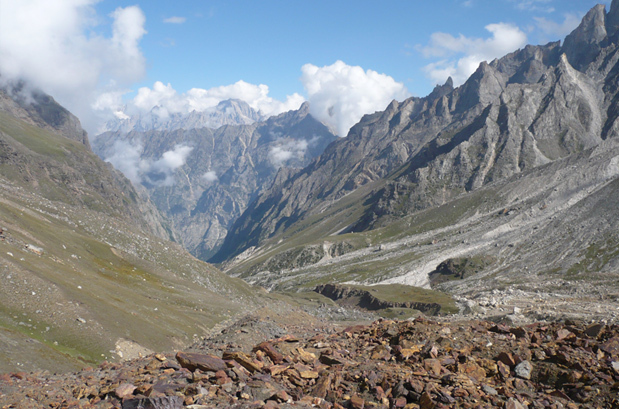 Till Gangotri, the trek route is really tough one, with lots of turns, climbs and rocky surfaces. The meadows and the shades with unparalleled beauty of nature god will never allow you to feel the tiredness. 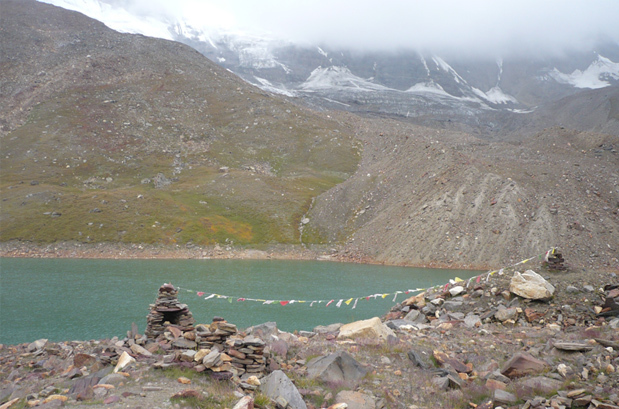 The route till Bhoj Kharak and from there to Kedartal Lake is filled with excellent flora. You will feel the beauty and the admiration for heaven, once you go there in the autumns. Outstanding lake view and ridge view are attracting photographers just like the flower pollen grains do to the bees. Excellent backdrop, from nature shows how much motherly affection she is having. Beauty throughout the trek has been awesome in all words. As you will cross all the levels, you will feel that your stock of words is at the bottom-most level, to explain the beauty of nature. Meadows and alpine forest that you will face in the trek route will give the refreshment that you need from the nature mother. She is always ready to give you the love and blessings – sometimes as nature and sometimes as the protector of the ancient mythological holiness. Once you reach the Lake of Kedartal, you will just feel to be in the heaven. The lake is regarded to be the gift from Lord Shiva to Ganges, as a token of blessings, for she reached the earth. Putting Gangotri and its mythological stories apart, you will also find the inspirational rock, called Bhagirath Shila, where Bhagirath sat and prayed for Lord Shiva's blessings. The panoramic view of the place, especially the ridge that Shiva presented will just take away all words and senses from your heart. You will feel blessed to reach heaven, even in this body, after you go through the accentual beauty of the place. Its essence, affluence and odor will just make you fall in childhood love for nature. The spirits, who are beyond all the mythological understandings, reaching at this place, feel the touch of god. So, heaven it is and you are going to explore that very soon. 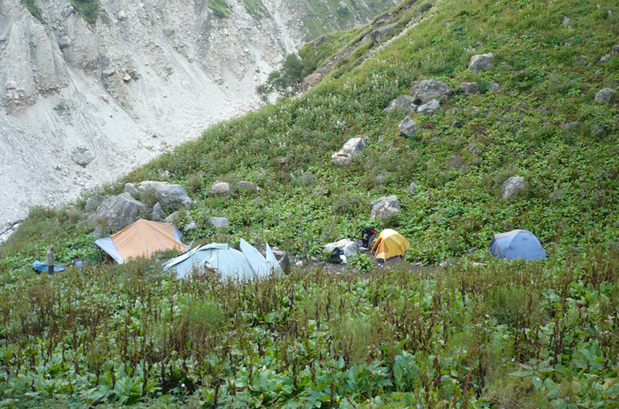 Enjoy camping in the lakeside of pristine Kedar Tal. 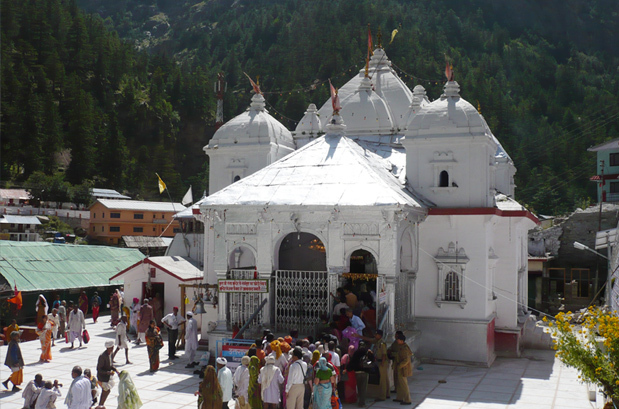 Seek blessings of goddess Ganga in Gangotri Temple, one of the sites in the Chota Char Dham pilgrimage circuit. Summer: The weather of Kedar Tal Trek remains salubrious and pleasing during summers. The Himalayas are distinctly visible and the cool breeze adds charm to the vacation. Carry woolens with you. Where is the Kedar Tal? Perched at an elevation of 4,750m, Kedartal, commonly known as Shiva's lake), is a glacial lake in the Garhwal region of the Himalaya. 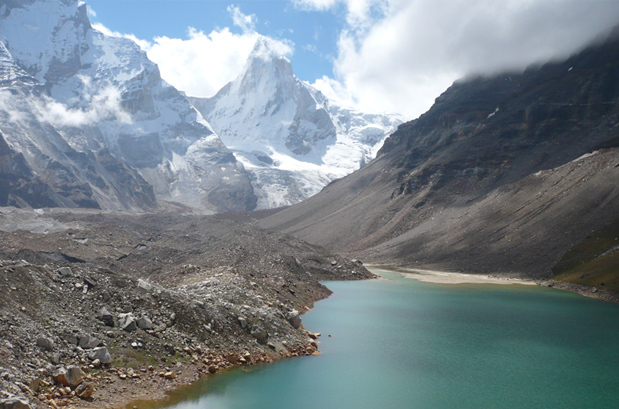 Three prominent peaks- Thalay Sagar (6,904m), Meru (6,672m), Bhrigupanth (6,772m) -are the lakes source of origination. To reach the lake, one will have to trek for 17 km through narrow meandering trail and craggy boulders. Nearest Railhead: Haridwar Railway Station, 325 km from Gangotri, is the nearest railway station. Nearest Airport: Jolly Grant Airport in Dehradun is the closest airport, 227 km from Gangotri. To reach Kedar Tal, one can either take two days or five days, it all depends on how well you acclimatize at high altitudes. 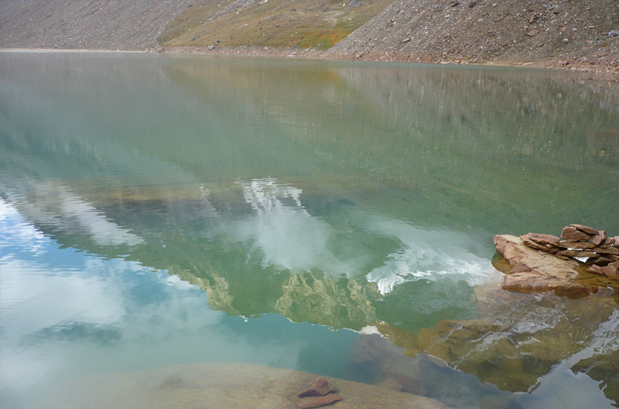 Trek to this beautiful high altitude lake commences from Gangotri. In the morning catch an AC train for Haridwar at 06:50 hrs from New Delhi train station. After arriving in Haridwar meet our guide and drive to Rishikesh which will take 45 minute, check into your hotel. Evening time is free for leisure activities. Overnight stay at the hotel. Undertake a drive towards Uttarkashi along the narrow valley of Bhagirathi. Today we will pass some beautiful hill town like Chamba, Tehri and Chiniyalisaur. 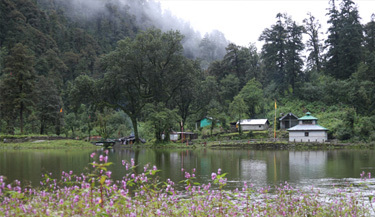 Arrival at Uttarkashi by afternoon and check-in to a hotel in Uttarkashi for night stay. One can visit the famous Kashi Vishwanaath temple in Uttarkashi. Drive to Gangotri. Gangotri is one of the Chota Char Dhams of Uttarakhand. It holds a great place in the Hindu religion. It is the place which marks the birth of Ganga on earth. 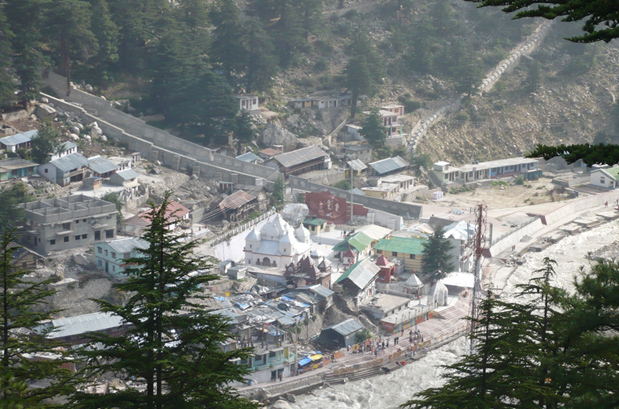 There is a Gangotri Temple where Goddess Ganga is worshipped. The river originates from Gangotri glacier at Gaumukh, which is about 18 km from the Gangotri Town, at this stage it is known as Bhagirathi. 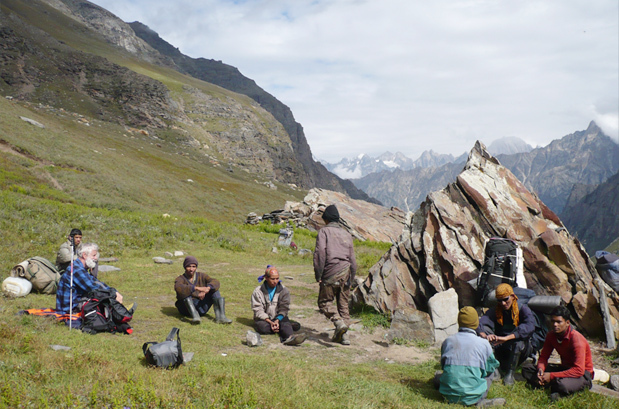 A day's trek can take on to Gomukh. Night stay in a hotel. Post breakfast begin the trek towards Bhoj Kharak. The 8 km long trail goes by the banks of Kedar Ganga River and consists of a dense cover of Cedar and Birch (Bhoj Patra) forests. It is a little hard trek but respite keeps coming in the form of scenic waterfalls and beautiful views of nature. Reach Bhoj Kharak (named after Bhoj Patra trees), set up camp. Embark on a steep ascent which takes us through a pleasant forest of birch trees. As the tree line is crossed, we will reach beautiful meadows, which will also be the site for our camps. 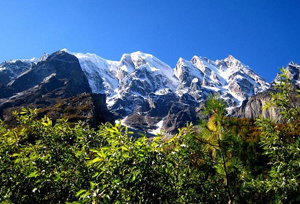 The whole landscape becomes more alive with the presence of Bhirgupanth Peak, which stands in the background. Meadows are frequented by shepherds, who come here to graze their sheep. Camps will be pitched near the banks of a lovely stream. Total distance covered today is just about 4/5 km, but the trek is strenuous because of its various steep climbs. Trek leading to Kedar Tal is difficult and goes through a trail which is strewn with loose rocks and boulders. 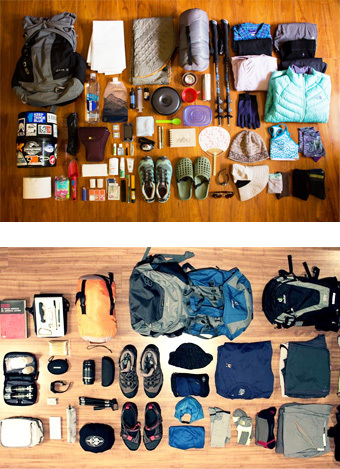 It will take a good amount of determination to carry on the trekking. But what awaits you at the end of the trek is one of the most marvelous works of nature. Kedar Tal is a glacial lake and has the majestic Thalay Sagar Peak behind it to form a perfect look. At the time of sunset the place looks heavenly. A blessed night in the tents near the lake. Getting up early today will gift you with incredible views. As the sun rises, the changing shades of the rays over the Thalay Sagar and its reflection in the lake are just super! Till lunch, explore the area; one might get to see the Himalayan Ibexes over here. Have lunch, and start on the previous route to go back to Bhoj Kharak. Night stay in tents at Bhoj Kharak. Early breakfast we will trek down to Gangotri town and from here drive to Uttarkashi via Harsil. On arrival check in to hotel. Dinner and overnight stay at Uttarkashi in hotel. In the morning after breakfast drive to Haridwar and from here catch AC train for Delhi at 18:05 hrs. Arrival at Delhi by 22:45 hrs. When to book Kedar Tal Trek? You should book Kedar Tal Trek well in advance (at least 2 month prior) advance so that you get ample amount of time to prepare well for the trek. Our pick up and drop point for Kedar Tal Trek is New Delhi train station at platform no. 16. We will send you the train ticket and you can board train from there to Haridwar. At Haridwar our guide will pick you from train station and then from there your tour will start. What is minimum age required for Kedar Tal Trek? 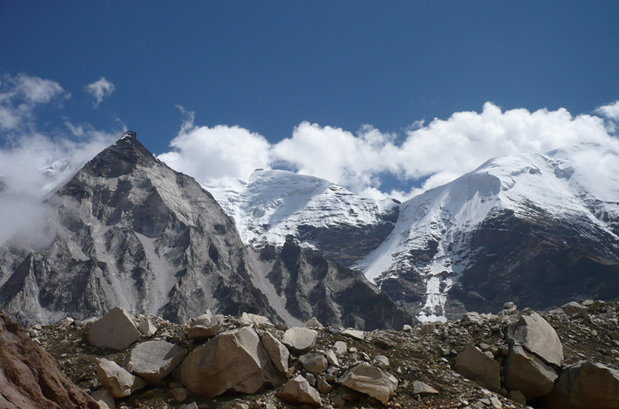 Kedar Tal Trek is a moderate trek with a maximum altitude of 15580ft (4750m) minimum age required is 12 years. What will be the minimum temperature during Kedar Tal Trek? 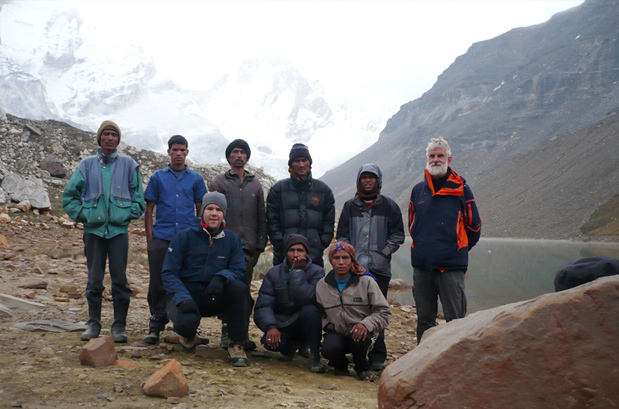 How long we trek during Kedar Tal Trek?